Info: A best-of set celebrating Maaya’s 15th anniversary since her debut, released on her 30th birthday (hence 30 total tracks). There was a first-press bonus DVD containing PVs for “Magic Number” and “Everywhere.” At the one-night-only live concert at the Budoukan the same day this was released, a magazine containing interviews and other bits of information was sold. 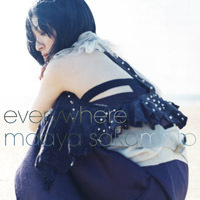 A list of Maaya’s liner notes for this album was published inside, translated here. There is also the official “liner notes” about the album as a whole, not written by Maaya. Links to other translated interviews and articles related to this album collected here. Maaya’s liner notes: At the moment when I first heard Haruna Yokota-san’s melody, I was able to get the song lyrics done too. This is one song about an electrifying encounter. Watanabe-san’s arrangement again overflows with a male presence, it’s amazingly cool. I seriously think that I was born to sing this song. Song info: Linebarrels of Iron second ending theme. Maaya’s liner notes: When I’m singing this song I’ve really cried my eyes out. Why is that? At any rate, it’s a song that feels like it’s about being able to let yourself do something for the first time. then I will wrap you all up.